When you phone the surgery for an appointment, the receptionist will ask you why you need this appointment. This will help to make sure you can see the most appropriate clinician and sufficient time can be allocated for your visit. Patients are usually able to access an appropriate clinician within 24 hours and in fact, often same day appointments are also available. I addition, you can book several days / weeks in advance should this be required. This will enable you to book reviews, vaccinations and routine checks for a time and date to suit your circumstances. But please remember to cancel your appointment if it is no longer needed - or re-schedule if you can no longer make it for the time it was booked. Can patients please note that appointments can only be made by telephone between the hours of 08:00 and 18:00, Monday to Friday. Outside of these hours the telephone is diverted and there is no access to the appointment system by either NHS 24 or the on call doctor. For an appointment with a GP phone 01381 622000, or call in to reception, during office hours. You will be offered the first available appointment with an appropriate clinician within 48 hours. If you request a particular doctor of your choice this might take longer. If your problem is urgent please explain this to the receptionist, who will give you an emergency appointment for that day. This may not be with the doctor of your choice and you may be asked to speak to a doctor to discuss your problem. 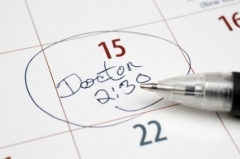 This will help the doctor decide how urgent your request is and how soon you need to be seen. If you have been asked to make an appointment for a medical examination please tell the receptionist, as you may require a half hour slot. Bring any documentation you have with you. Please note that there may be a charge for some medicals performed in the surgery and you are advised to check this with the receptionist. Late or early appointments: The surgery provides appointments from 7.30am most Wednesdays and Thursday, as well as up to 6.15pm most Tuesdays. These appointments are for those patients who cannot visit the surgery during normal opening hours (e.g. because of work commitments) and have to be pre-booked in the usual way. The doctors and practice nurse are happy to offer advice on the telephone, during the surgery’s opening hours. If the call is urgent please say so to the receptionist at the start of the call to ensure high priority. Individual doctors and the practice nurse are not always available to take calls immediately! You may be asked to speak to another member of the clinical staff, or to wait until the preferred doctor is free to call back, or you may be asked to call back at a given time. For an appointment with the practice nurse phone 01381 622000, or call in to reception, during office hours. Nurse clinics are held on Monday afternoons and Tuesday to Friday mornings and afternoons. The practice employs two Health Care Assistants, who are trained to take blood, measure blood pressure, remove stitches, perform ECGs, give flu vaccinations and much more. This list of duties is not exhaustive and ongoing training will add to their competencies. Health Care Assistant clinics are held on Monday, Tuesday, Wednesday and Thursday mornings. We hope to see you at your appointed time but you may have to wait. This will be due to the doctor or nurse dealing with another patient. The problems of other patients are often urgent and /or complex. This can be frustrating for all involved but we will keep you informed if there is a delay. If you have any queries please see the receptionist. Patients are welcome to attend any appointment accompanied by a friend or relative, if they find this helpful. Patients attending on their own may also ask for a chaperone to be provided during a consultation with the doctor or nurse. If required an interpreter can be organised to accompany the patient to see the doctor but we will require prior knowledge of this so that we have time to make the necessary arrangements. We can also arrange support for communicating with deaf patients or with deaf-blind patients. This includes British Sign Language, Lip speaking service, note-taking service and deaf-blind interpreters and communicators. Please note that we will require prior warning of the need for such services so that the necessary arrangements can be made. From time to time we teach medical students and other doctors. This will not be done without your consent. You will be asked before going in to see the doctor whether or not you agree to being videoed or to having another clinician present during the consultation. We ask you to cancel your appointment as soon as possible, if it is no longer needed. A large number of appointments are wasted each month because patients fail to cancel unwanted appointments. The amount of time lost by patients not cancelling appointments is displayed in reception on a monthly basis. You can cancel an existing appointment by clicking on the link below. Remember to give us your full name, date of birth, who your appointment is with and the date and time of your appointment.